"From appointing women to top leadership positions to our new expanded parental leave benefits, we are creating an even more diverse and inclusive culture where women and men have an equal opportunity to grow, succeed and advance in our enterprise." ST. PAUL, Minn.--(BUSINESS WIRE)--3M took home the coveted Catalyst Award Wednesday night during a gala ceremony in New York City. Catalyst, a nonprofit organization championing the advancement of women in the workplace, recognized the science-based company for its “I’m in. Accelerating Women’s Leadership” initiative. 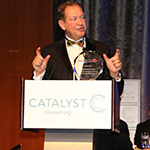 3M’s Chairman, President and Chief Executive Officer Inge Thulin accepted the award. While 3M’s initiative focuses on women in the management pipeline and across the company, it is part of a broader “I’m In.” organizational approach to engage and develop all 3M people worldwide. This includes, in part, a formal leadership development program, a global network of 78 women’s leadership chapters, and 3M FlexAbility arrangements support a flexible workplace culture. In recognition of International Women’s Day on March 8, 3M’s Women’s Leadership Forum hosted a series of leadership and networking events throughout the day to motivate and develop all 3Mers. 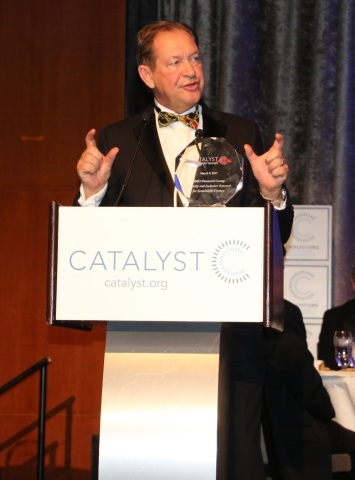 As part of 3M’s commitment to build its diverse and inclusive work culture, Mr. Thulin signed on to Catalyst’s new CEO Champions For Change initiative, announced March 8. Thulin, along with more than 40 CEOs and industry leaders have made personal pledges to accelerate gender equality and inclusion in their organizations. Progress will be tracked, analyzed and reported to inspire more companies to make similar commitments. To read more about the initiative or join the movement, go to www.catalyst.org/Champions. More information about inclusion at 3M can be found at http://www.3m.com/3M/en_US/careers-us/inclusion/. Founded in 1962, Catalyst is the leading nonprofit organization accelerating progress for women through workplace inclusion. With operations in the United States, Canada, Europe, India, Australia, and Japan, and more than 800 supporting organizations, Catalyst is the trusted resource for research, information, and advice about women at work.